By now you’re probably well aware of the term “newsjacking” – you probably see it happening all the time on your Twitter feed. This controversial guerrilla marketing tactic is used by brands to piggyback on the day’s biggest news stories in order to draw attention to their own brand. While on the surface this might seem like something PR people have been doing for years, newsjacking has taken the practice to a new level. The traditional outbound approach of sending a press release to hundreds of journalists via email doesn’t work so well in a world of instant communication, but newsjacking has an immediate impact on a brand, as content is shared in ‘real-time’, allowing a brand to become part of a trend as its happening, whilst also capturing the highest traffic for popular keyword and hashtag searches. Done well, newsjacking can push your brand in front of thousands of potential customers and help you receive a higher click-through rate to your site. 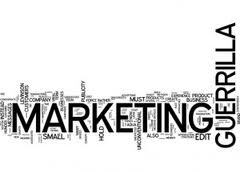 However, when done badly, it can be extremely damaging for a brand. 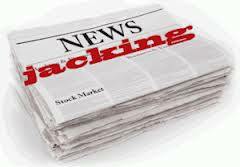 Let’s look at the good, the bad and the ugly of newsjacking. The ad was retweeted over 15,000 times, and the photo generated over 20,000 likes on Facebook. 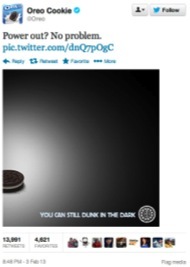 The term “Oreo” even trended on Twitter during the big game. In 2012, Hurricane Sandy swept in from the Atlantic, leaving nearly 300 people dead. But this didn’t stop some companies from being jocular about the event. 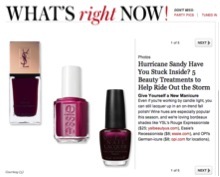 InStyle magazine used the natural disaster to promote a cosmetics range. In an article entitled, ‘Hurricane Sandy have you stuck inside? 5 Beauty treatments to help ride out the storm’, InStyle promoted five beauty treatments that they claimed would help keep people ‘occupied and gorgeous’ as they safely waited out the storm. This frivolous attempt at newsjacking was in extremely poor taste and triggered a negative backlash from the public and press. The online community reacted with repulsion, as the tweet trivialised what was happening to millions of people in Egypt and the rest of the region. The company later retracted the tweet and were forced to issue an apology.